Arbitrator has told the Clippers to pay Dunleavy…..HUH!! An arbitrator has ruled that the Los Angeles Clippers must pay former coach and general manager Mike Dunleavy $13,517,000 in compensation. Although the case was heard several months ago before the Arbitration and Mediation Services in Santa Monica, the parties in the case were formally notified Friday. The Los Angeles Times first reported the decision on its website Friday afternoon. Dunleavy’s lawyer, Miles Clements, hailed it as a long-expected victory over the franchise, which had ceased paying Dunleavy in March 2010 after firing him as general manager. Clements added that since it was a binding arbitration case, there is no room for the team to challenge the ruling. “They’ve got no place to run,” Clements said in a telephone interview with ESPNLosAngeles.com. “This was a binding arbitration. Any lawyer who litigates will tell you that the grounds for challenging an arbitration award are exceedingly narrow and would not apply here. The key issue in the case was whether Dunleavy breached his contract by resigning as coach of the Clippers in February 2010. At the time, it was announced as a mutual decision. But in testimony presented to the arbitrator, several witnesses said Dunleavy had been forced to resign, Clements said. “Their position was that Mike resigned from his coaching duties and refused to coach and therefore was in material breach of his contract,” Clements said. 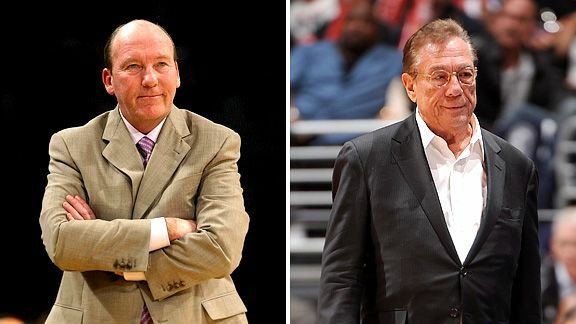 The witnesses who testified before the arbitrator included owner Donald Sterling, Dunleavy, Clippers president Andy Roeser, current general manager Neil Olshey and Michael Goldberg of the NBA Coaches Association. Clements also argued since the Clippers paid Dunleavy in full during the month he was acting only as the team’s general manager, it signified the team did not regard him as breaching his contract by resigning as coach. “There’s a principle of law that intent of the parties to a contract are determined by their conduct before a dispute,” Clements said. “They continued to pay Mike a full salary due under the contract for a month, then out of the blue they fired him, never gave him any explanation and didn’t pay him a penny. In the release announcing Dunleavy was relinquishing his duties as coach, a statement attributed to Dunleavy reads: “I’ve had several conversations with our owner (Sterling) concerning what we think is best for the team overall. We have discussed the possibility of my concentrating only on basketball operations. That option has always been available to me. However in sworn testimony before the arbitrator, Dunleavy and several other witnesses said he had been given no choice but to resign as coach. When asked why Dunleavy would issue a public statement indicating the decision was mutual, Clements said, “That was a media spin to try and put the cloak of professionalism on this and suggest mutuality. It was in everyone’s interest. Mike was going to be the general manager, it would undermine his position if they said, we’re not going to let him be coach anymore. Dunleavy was fired in the fourth year of a five-year, $22-million contract. The award reflects both the money that remained due on the contract, money that had been deferred, and interest on the money Dunleavy would’ve collected had the Clippers been paying him since March 2010. The arbitrator ordered that it be paid immediately.